When I graduated from college and moved to my very first apartment in Boston, I decided that I should represent my foray into adulthood by sending sophisticated Christmas cards (homemade resplendent with stickers) to all my family and friends announcing that I was out on my own. Five years later, I am still on that kick. If you are a member of my immediate family, newly acquired immediate family, or one of a select group of friends, you know that I mail cards for almost every holiday - Valentine's Day, Easter, and then my busy season starts - Halloween, Thanksgiving, and my big push - Christmas! It is meaningful to me that I am spreading good cheer and happiness card by card through the U.S. Postal Service. So after a fruitful trip of photo shooting to Louisiana, we came away with this doozie of a card! My husband was none too happy that we were not represented in the card, but quite frankly, I do not need anyone commenting on my current dress size or hair color tinge. Milt always seems to look pretty darn good, so I thought we should lead with our best! 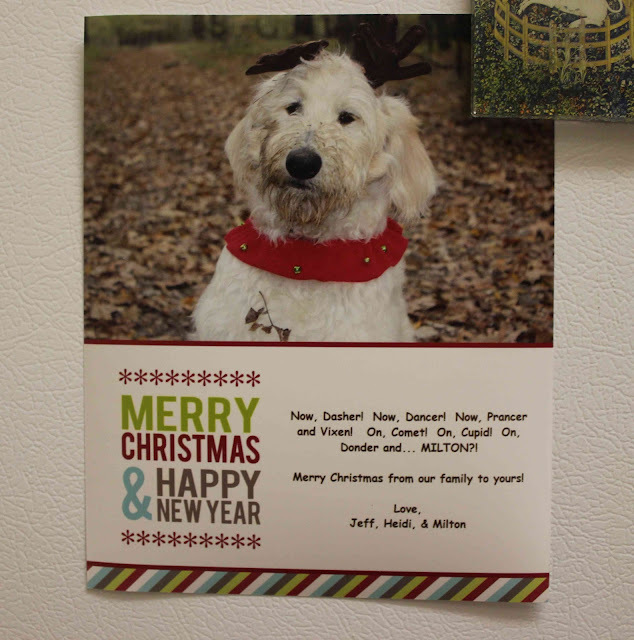 All I know is during the entire month of December, I am going to be running out to our mailbox to see what adorable doodle cards have arrived for our Milt! This should add a little excitement, and joy, into our lives! If you rarely mail letters, consider it because happiness can arrive in the form of a simple letter or card. Oh his photo made my morning; lopsided anters, mucky beard, and a small branch he's saving for later.....PERFECT!